There may be no alternative to a beautiful face that not only contributes to your overall beauty but also enhances pleasant personality. It is for certain that in spite of all your efforts and exercising caution, you might still lose out on sustaining and maintaining the freshness of your face. Aging has its role to play but it is not the sole reason why you lose charm and youthfulness of your face from time to time. Once you have already attained some abnormality, there is virtually no point in contemplating about the possible reasons behind it and the ideal thing to do is to look for appropriate solutions. At our London Clinic for Cosmetic Care, we have wide range of beauty enhancement solutions among which facial rejuvenation with Liquid Facelift is one of the most desirable procedures. It is interesting to know how the ideal shape and structure of your face is sustained by your cheekbones and chin; it all depends on how proportionately they are balanced. According to the experts from the field of cosmetology, the outward appearance of your face covering cheekbones and chin must have a V Shaped impression. This happens when there are also ideal sized cheeks and if the cheeks volume is less, it might lead to an abnormal Reverse V shaped impression. In this situation, your overall face appears to be out of balance and fortunately this condition can be reversed with the help of dermal fillers used in Liquid Facelift Procedures. Liquid Facelift represent the class of cosmetic therapies that doesn’t require surgical interventions which itself is a great advantage of this treatment meant to revive your facial appearance by replacing the lost volume of your cheeks. This also reflects the growing significance of non surgical procedures with time. Dermal fillers that are used for the sake of facelift are only meant for enhancing the external shape and appearance are relatively safe to use and will not have any impact on the functional aspects of your body. More importantly, they can be trusted for sustaining the newly accomplished facial structure for long time in the future. The facelift procedure offered at our London Clinic is also about enhancing your emotional and psychological demeanor apart from the cosmetic change. In fact the cosmetic change you experience contributes to your improved mental health. Facelift is performed to enhance the image of a person and in the process of achieving a redefined facial appearance; you can refresh yourself in many ways including a new resolve to maintain your positive personality with more care and caution. It might look to be a fringe benefit, but has a huge impact on your behavior. The significance of Liquid Facelift can also be understood in relation with growing demands and maturing trends in cosmetology. Cosmetic solutions need not be limited to permanent structural changes and rightly so the modern cosmetic solutions are designed to address specific challenges and requirements. Your choice of cosmetic clinic would play an important role in the success of your facial uplift and enhancement therapy for obvious reasons. Our London Clinic has been the premium choice for many patients because of the quality standards we maintain and more over the care one can expect. Though the procedure of Liquid Facelift with dermal fillers appears to be pretty straight forward and simplistic, there are sensitivities and considerations that are better addressed by cosmetic experts. Our experts will ensure that you are treated with necessary care and expertise to fulfill the treatment objectives and your preferences. We recommend combination therapy with wrinkle smoothers, dermal fillers and lasers for the sake of accomplishing a renewed face that regains the lost V shaped appearance. Radiesse® and Juvederm® are the two types of fillers we recommend at our clinic, they are our expert choice because of reasons including their reliability and high success prospects. Moreover, the final outcome looks pretty much natural that is way different from an artificial look offered by conventional products. 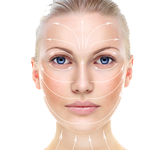 Along with the dermal fillers, you may have to use facial peel which is recommended based on your skin type assessment. The procedure would require injecting the dermal fillers for facelift in a sequential manner on the target regions of your cheeks. This procedure is performed by cosmetic experts who have the know-how of injecting through fine needles. Overall it is a sensitive procedure with sophisticated products at work, more importantly it has to be personalized to match up with your facial type, skin properties and other preferences. The nature of this therapy is not very complex and doesn’t require surgery which itself is a comforting factor for you if you are considering facelift. Liquid facelift with dermal fillers and wrinkle smoothers do not have the record of post therapy complications that can categorize the therapy as a sensitive one. Patients who have opted for facelift in the past have acknowledged about their pleasant experience. The procedure related side effects and possible complications can’t be totally ignored and it is good to be aware of them as well. Pain associated with the procedure can be managed well and it is good to be prepared to handle pain instead of taking it for granted. Swelling, redness and injection site reactions are common; these complications will scale down without any special treatment. It might take twelve hours to three days for the pain and swelling to subside, if any. You can retain the renewed facial impression and freshness for 18 months with better post therapy care and maintenance. Nu Cosmetic Clinic is recognized for its reputed cosmetic solutions and positive track record, our centers for cosmetic care and excellence are spread across the UK. We assure you the best of quality treatments and care from all our cosmetic centers that are comparable with the London Clinic.